Better to create a specific Resource Pool for your Big Data Cluster and specify the total amount of resources you want to assign and apply possible limits. Create a port group dedicated to Big Data Extensions as a communication link between management servers and working VMs. When deploying Big Data Extensions Management server (OVA), ‘setup networks’ asks you to assign a destination port group. Note that: Management Network will use this network to communicate with vCenter server. So, if you use VLAN tags, the port group should be in the same VLAN (use same VLAN id) with vCenter network. 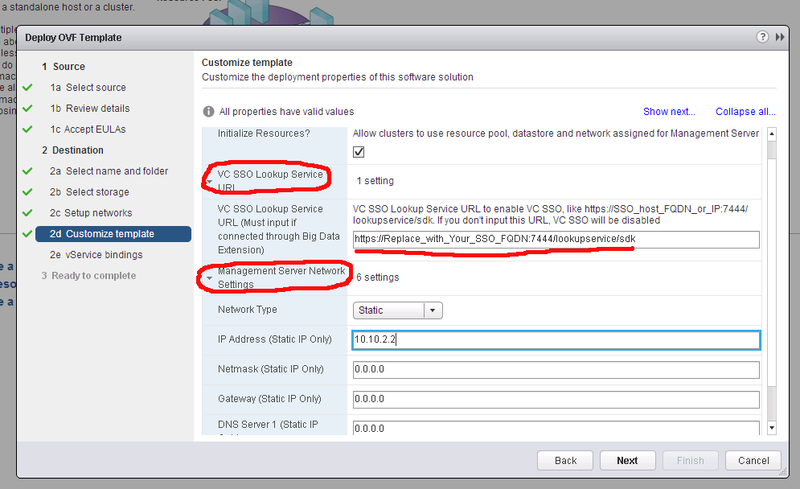 If vCenter can not see Big Data Management server and vice versa, integration will not be made properly. In ‘Customize template’ step, there are 2 important settings: SSO service and Management Server IP address. So, from right-pane open ‘VC SSO Lookup Service URL’ and ‘Management Server Networks Settings’. Enter appropriate values. For SSO Lookup Service URL, use vCenter server with the same format (if you didn’t change defaults), I mean port 7444/lookupservice/sdk. Use FQDN of vCenter and not IP address or certificate will not be accepted and you will see errors for connecting Big Data Extensions plugin to Serengeti server in the future.